With magnificent views over Millstattersee lake, we offer comfortable accommodation in apartments for 2 to 4 people. Situated at the quieter, eastern end of the lake, above Döbriach, our south facing Balconies/Terraces and Garden, offer uninterupted views to the lake for all of our guests to enjoy. 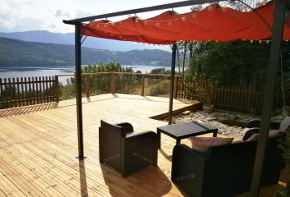 The southern European climate enjoyed by Carinthia, allows guests to lounge on their private Balcony/Terrace and enjoy almost guaranteed sun. Our Sun Terrace offers the perfect place from which to take advantage. Together with the peaceful tranquility of our position, this really is a place in which to relax and leave the stresses and strains of modern day life behind. For the more active, walking and biking trails are available from your door. The lakeside with its water activities, including; swimming and sailing are a 15 minute walk away. All our of guests will receive a voucher offering free entry to a local bathing area. During the Winter, skiing at Bad Kleinkirchheim and Goldeck are just a short 15 minute drive away. 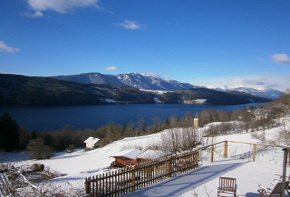 Your ski-pass covers all resorts in Carinthia, ideal for the adventurous! We are pleased to offer all of our guests staying 3 nights or more 15% discount on the Carinthia Top Ski-Pass or Bad Kleinkirchheim Ski-Passes. For the non-skiers; relax in the renowned Spas of the region. All apartments are non-smoking, with private shower & WC and kitchenettes equipped with; hot plates, dishwasher, fridge, coffee maker, kettle, and toaster. Plans of each Apartment are available on request. We are pleased to offer our guests free Parking and Wifi. Our pricing is based on a maximum of 2 Adults within an Apartment, please contact us for prices for additional Adults sharing an Apartment. Our prices include; all bed linen, one set of towels and all local taxes, there is no end cleaning charge. Debbie and Trevor, will be please to meet you and help make your holiday with us a most memorable one. is our largest apartment, with two bedrooms to comfortably accommodate a Family of 4, (2 Adults & 2 Children). is situated on the 1st floor; accommodating 4 people, with a west facing loggia. is situated to the front of the house; accommodating 2 people, with private garden terrace area. a family apartment situated to the front of the house with private garden terrace area. Ideal for 3 or 4 people. offers comfortable accommodation for 2 people. The apartment is situated on the ground floor with level access, ideal for those with reduced mobility. has a separate entrance and a large sitting/dining room and separate bedroom, both with access to a private balcony. Long lets available on request.